Charming, lyrical and surprising, THE UNEXPECTED GENIUS OF PIGS throws open the sty gates into the fascinating world of a creature we wrongly dismiss as dirty and stupid (stubbornness is another matter) as Matt explores the astonishing truth about pigs. 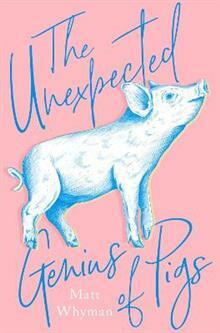 Charming, lyrical and surprising, THE UNEXPECTED GENIUS OF PIGS throws open the sty gates into the fascinating world of a creature we wrongly dismiss as dirty and stupid (stubbornness is another matter) as Matt explores the astonishing truth about pigs. `Dogs look up to us. Cats look down on us. Pigs treat us as equals.' Winston Churchill We often consider dogs to be our enduring sidekicks, but the truth is that domestic pigs have played a role in our lives for nearly as long. Pigs are highly social and super smart. They like to play. They have good long-term memories. They can tell which people are nice to them and which aren't. They sing to their young when they nurse them. They're inventive and crafty and belligerent - and incredibly single minded. If they want something, they'll get it. In fact, we have far more in common with these creatures than we may like to admit - although maybe some more than others. Shining a light on the simple genius of pigs, this delightful book will explore everything from evolution and behaviour to intelligence and communication; the wonder of a pig's nose to porcine relationships, friendships and feuds. Combining fascinating facts and insight, with personal pig-rearing experience, THE UNEXPECTED GENIUS OF PIGS is a celebration of a larger than life personality and an animal that can often have our measure. Charming, affectionate and full of surprises, join Matt Whyman on his journey to discover more about this brilliant creature. Matt Whyman had no intention of becoming a pig expert. When his wife set down the cat basket and welcomed minipigs Butch and Roxi into their family home, he barely registered their presence. Several years later, with the garden all but gone, Matt watched their two twenty-five stone hogzillas leave in a horsebox for a new life turning the soil on an organic sheep farm. In that time he'd learned the truth about minipigs (there is no such thing), got to grips with their upkeep and fallen in love with an animal brimming with more energy, intelligence, playfulness, sociability, spirit and soul than he ever could've imagined. Matt Whyman is also the author of several novels and two bestselling comic memoirs, OINK: MY LIFE WITH MINIPIGS and WALKING WITH SAUSAGE DOGS. He is married with four children and lives in West Sussex.